Christmas is the main theme of most catalogues like this Aldi Catalogue. Christmas trees and lights should be the things and reason to check out this Aldi Catalogue in the first place. LED lights, tree top decoration, ornaments and more can be seen on pg 6&7. 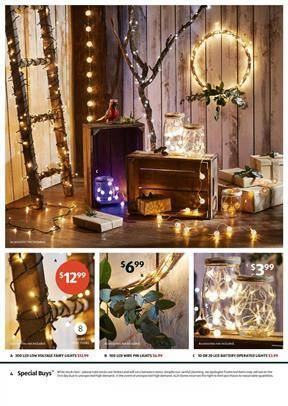 LED Solar Fairy lights will cost only $12.99-$17.99 on pg 2. See Laser light projector with a speaker that is priced at $39.99! LED Solar reindeer and rope light are amazing offers, too. You may see a lot of deals on crafts products, painting items, sketchbooks, paper sets and more on pg 14-15. The essential inventory of a professional artist can be bought at Aldi on Wednesday. You have a deep edge canvas, art case, acrylic artist paint that are all on sale. Create amazing art that will surprise everyone who looks on your portfolio. Doing that doesn't mean you need to spend a lot on the basic needs like these. All you need is browsing Aldi Catalogue for the top products at fair prices. Make a great place of the studio in your home. Home outdoor products like a beach towel, box cushion, tablecloth, food throw, and beach mat, and more are featured in the latest sale. Find a premium quality product for your bedroom, improve the quality of your sleep, and make your bathroom a great place to rest with the perfect deals by Aldi.